The BelloVaso Azuro 7-ounce Margarita Glass has an authentic, natural look with lovely hues of blue and green. It has a versatile design; perfect for festive and fun get-togethers and barbeques, it's perfect for the bar and it's perfect for everyday use. BelloVaso Glassware is exquisitely hand made by the skilled glassmiths of Mexico, as they have for over 400 years. 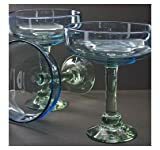 Wilton Armetale, maker of fine hand crafted metal serveware products, offers BelloVaso Free-Blown Glassware – drinking glasses, wine goblets, margarita and martini vessels and more. Although these pieces are incredibly beautiful, they are made to last. BelloVaso Glassware comes from the earth and gives back to the earth. Authentic, free-blown BelloVaso is made entirely of recycled glass products. Skilled and talented "glassmiths" of Mexico shape almost any form from molten glass by rotating long pipes, swinging and controlling temperature of the forming glass as they blow. Wilton Armetale is excited to present BelloVaso and proud to honor the craftsmen and women that carry on Mexico's centuries old handmade tradition. Wilton Armetale – capturing the spirit of your life with quality products and excellent value.